I've been a comic-book fan for more than five decades and on the web for more than 15 years, so inevitably I've posted a moderate amount of random comics material to this site over the years. Sadly, it isn't very well organized nor complete. Still, it's worth trying to update now and again, so here goes another attempt. I'm nowhere near the artist my son Ian is, so while I've made up a lot of comic-book character over the last 50 years or so, I've only recent started showing them to other people, and largely through the good auspices of a couple of very talented Web developers, Jeff Hebert, the author HeroMachine, and Eduardo José Reis, the creator of Fábrica de Heróis, also known as Hero-O-Matic, two very clever web applications for creating do-it-yourself superheroes. I discovered HeroMachine back in its V1 days, and gladly paid the modest fee to buy a copy. Since then Jeff has released versions 2 and 2,5, fairly substantial upgrades, and is currently working on his masterpiece, HeroMachine V3. Fábrica de Heróis descends from a fantasy role playing game character creation tool known as RPG*Quest Hero-O'Matic, which could also be used to create a limited number of masked heroes. 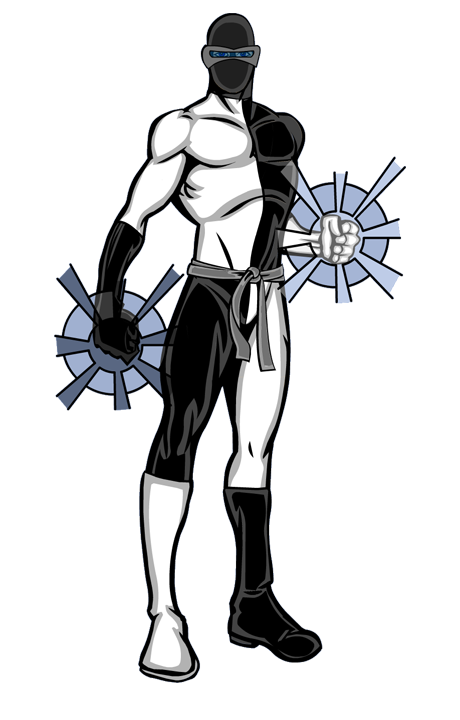 The first version of Fábrica de Heróis, which never got out of alpha test, completely reworked the art in a style reminiscent of Bruce Timm and the DC Comics Animated Universe". It was very stylish and very cool. Unfortunately, people thought the style was a bit too much like the DCAU and so the beta version has a totally different style of artwork. 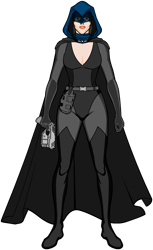 Bette Noir started several years ago when I was considering the notion of running another Comic-book role playing game. Many years ago (a quarter century, would you believe), Chris Walsh of "The Whiz Store" and I ran a Super*World game that was a lot of fun, and I was getting a bit nostalgic for it, so I started working on a game universe to et a new one in. To give me a handle on the setting, I decided to create a character who had lived throughout the whole modern superhero era, rather like Tom Strong or Jenny Sparks. And so was born "Mystery Woman", a character born sometime near the beginning of the twentieth century whose career started out as a pulp heroine of the Doc Savage or Shadow school, and evolved through the golden and silver ages of comics to the present. After noodling around with the Mystery Woman concept for a while, I decided that rather than a single incredibly long-lived character like Jenny or Tom, the Mystery Woman should be a series of characters who inherited the mantle over the years, and that she should have a number of sidekicks and ancillary characters, and so "Mystery Woman" turned slowly into "Bette Noir", with her sidekicks Giordano and Bella Donna, and Bella's alternate identity "Deadly Night Shade". 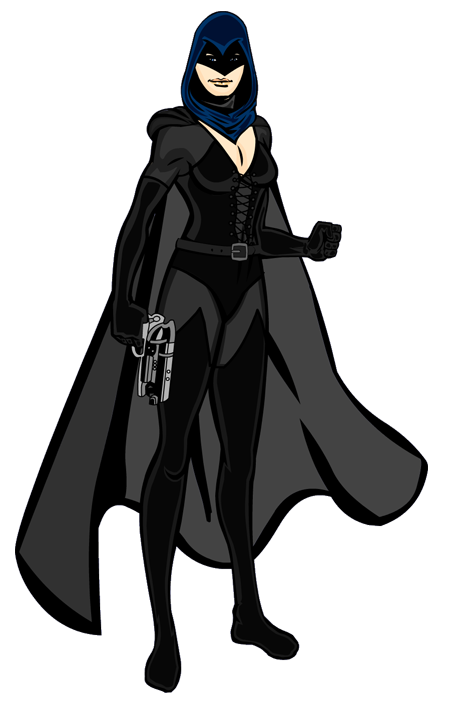 Bette starts out as a Green Hornet-style non-powered woman of mystery, who turns out to be the leader of a network of operatives, à la the Shadow. Her Kato-like chauffeur is replaced by the teenage side kick, Bella Donna. Like The Crimson Avenger, she shifts from a signature outfit of street clothes to a super hero costume, and that evolves through the different styles of the golden age, good girl art, the silver and bronze ages, and so on. Along the way various Bellas grow up to replace their Bettes or become the next Night Shade. Along the way, Bette transforms from just a figure of mystery to a wielder of marvelous gadgets and occasionally the possessor of super powers. 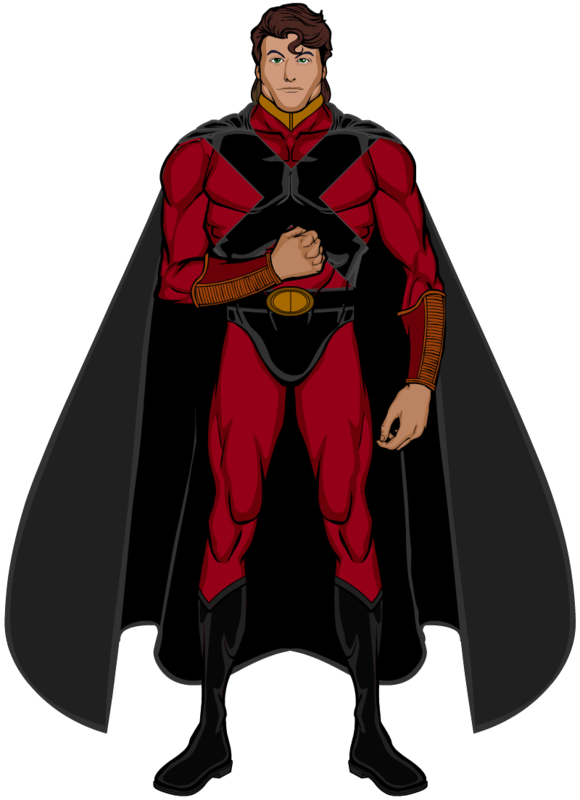 Various superhero teams and other characters get drawn into her story along the way, including the first superhero I ever created, Twilight, who owes some of his costume to the Golden Age Daredevil, and some of his powers to Dr. Midnite and the Phantom Lady, or the fan-creation, The Eclipse. Eventually, her world and family became well enough sketched out that I started to write it up, illustrating it with costume designs done in Hero Machine v2. The page is about my most complete comics-based project, giving the "outside world"'s view for the characters, complete with newspaper and magazine covers. 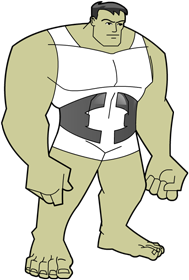 Just about the time I finished the first draft of the page, I stumble on Hero-O'Matic, with its Bruce Timm-style artwork, and so I added one illustration (the cover of a DCAU-style comic "Beauty and the Beast Adventures") to the page. The result is this Bette Noir page. 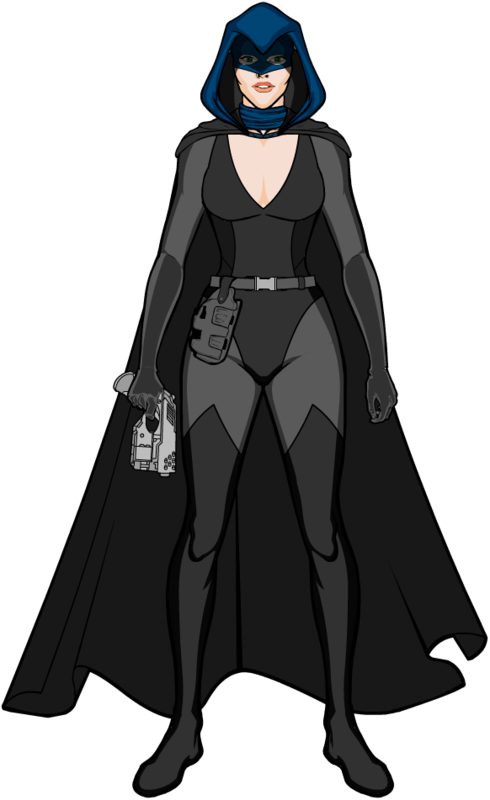 Since Bette Noir was intended as the centerpiece character for a whole fictional universe to be used if I ever run another comic-book RPG, she spun off lots of characters as members of the various superhero teams she was a member of throughout her career. Having started to play with Hero-O'Matic just as I finished her page, I got all caight up in playing with it and created literally hundreds of images, some of existing characters from DC, Marvel and a number of lesser companies, and many of them of my own devising. A few of these latter can be seen in in my "Mystery Men and Women" page. All of this led me to my next big comic-book project—this one still on-going. As I thought about the notion of a world that had had pulp- and super-heroes running around in it since at least the 1920s, it occurred to me that there should be at least one large extended generation-spanning family of heroes, something that Kurt Busiak touched on some a bit with the "First Family" in his Astro City universe. The Fursts, however are still not quite the large clannish extended family that I was thinking of, and so I started of to create one. I was rather fond of the look I had come up with for an unnamed blonde martial artist while playing with Hero-O'Matic, so her look became the central design theme of the modern version of "The Family". Jeff Hebert has been running character design contests on his Hero Machine blog, and I've been having a good deal of fun entering it. The contests are a lot of fun and many of the regulars do really excellent work. I've put together a page with my entries on it. A few of them relate, one way or another to the characters in some of the pages mentioned above. 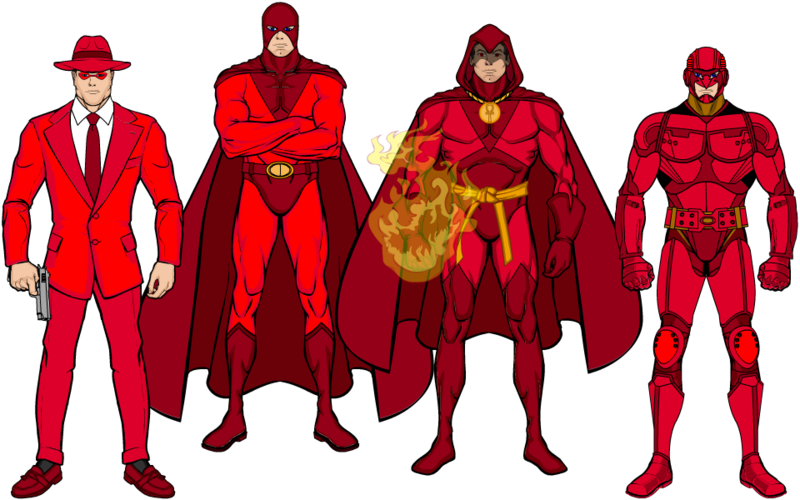 There is an alternate evolution of the Man in Red, for instance, and a "Mirror/mirror" pair of characters named "Nightshade", though these two are male. A few years back (all right—about a dozen years ago), I did a number of web pages about comic-books, most of which have not been updated, and the largest project didn't even get finished. Here's a list of some of them. The very first projects that I created using Hero Machine were done for the folks at work. While I was the manager of the Technical Operations team at TV Guide on Screen, my boss referred to one of the guys as "Captain Canada" because he was in charge of all of our Canadian data upgrading. This resulted first in an HM portrait of him, then of the whole Tech Ops team and then when we were massively downsized there was even a "Decimation" tie-in comic-book cover.. The saga of "Team Tech-Ops" can be found here. Back when I was trying to do regular comic-book reviews, I started a larger project, writing in general about the trend towards strong women in comics. This turned out to be my biggest unfinished project. There were supposed to be 5 pages in the section: three reviewing the history, one on current trends and the last a review of Trina Robbins' book, The Great Women Super Heroes . I finished and published the three historical pages, but never completed the contemporary sections or the review. The Maze Agency, the only one updated in the 21st century. And finally a question... While playing with Hero O'Matic, I found myself slightly perplexed at one costume element that the program offered. I just cannot place it in all the history of superheroes. It makes a pretty cool Green Lanterneque sort of costume, but what the heck was it supposed to be? Anyone know?